Families involved in the Aberdeen baby ashes scandal have demanded those responsible for the “disgusting” practices at Hazlehead Crematorium face justice. Prosecutors were last night examining the contents of a damning report on the way the facility was run “for years”. The Crown Office confirmed the contents of the National Cremation Investigation led by Dame Elish Angiolini were “under consideration”. Aberdeen City Council was heavily criticises in the report and under-fire council chiefs confirmed yesterday they were contacting their legal and HR chiefs to consider the next steps. Chief executive Angela Scott will make a statement at today’s full council meeting. A city council spokeswoman said the local authority would “assist the Crown Office if necessary”. Dame Elish’s investigation looked at more than 200 infant cremation cases across the country following the Mortonhall baby ashes scandal in 2014. It found that in Aberdeen it was “commonplace” to cremate infants in the same chamber as unrelated adults. Baby and adult ashes were then mixed together and given back to relatives of the adult – while the parents of infants were told there were no ashes. In total, 15 recommendations were made including a law to prevent the mixing of baby ashes with those of another person, proposed criminal sanctions and tighter regulation of crematoria. Town house sources said last night they did not believe anyone would be prosecuted for the historical incidents, although they could not rule out retrospective action being taken. Derek Snow, city council’s long-serving crematorium manager, was dismissed in 2014. Two other members of staff were also subject to an internal investigation but no action was taken against them. Garthdee father Paul Wells, whose son Scott died of cot death in December 2006 when he was just a month old, never received his child’s ashes. The 42-year-old painter and decorator said he believed legal action should be taken against those responsible. Mr Wells said: “A lot of people think that they possibly deserve to be charged for what they’ve done. “As I knew, there were no laws in place to be broken at the time, so I didn’t think it possibly could happen, I didn’t think there would be charges brought. “I couldn’t single out anyone that deserves prosecution. That would be for the fiscal to figure out. “Charges should be brought if they can for what they’ve done, it’s absolutely disgusting and to think it’s acceptable in any way is completely wrong. “If the investigation team is speaking about retroactively charging them, if they can, it should probably be looked at. “The council’s paper-thin apology is exactly what I’d expect. Gillian Mellis, of Stockethill, lost her baby in 1997 when her pregnancy was at full term. She said: “They downright lied. “People need to be made to take responsibility for their actions. “Anybody who knew needs to be prosecuted. There were obviously quite a few workers who weren’t aware they were doing anything wrong because they were told from the outset that this is just how it’s done. “If somebody says to you at your job, this is how something is done, you wouldn’t question it. An Infant Cremation Commission led by senior judge Lord Bonomy was also found to have been misled about practices taking place there. 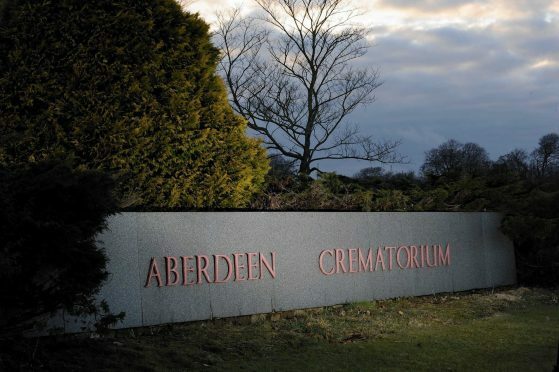 Inspectors will visit Aberdeen Crematorium in the coming days as a result of the shocking report. City council chief executive Angela Scott – who is due to answer questions on the inquiry for the first time today – vowed to share their findings with the local authority. She will appear before full council today to set out what action will be taken to ensure the authority’s “processes and procedures are robust” and to “reestablish the right atmosphere of trust, openness and transparency”. Ms Scott said last night: “I know that this has resulted in significant distress and I am determined to begin the process of restoring public confidence. “I urge all those affected to call our helpline (01224 522255) to seek any support that they may need. “Today I have asked my heads of legal and HR to consider in full the implications of Dame Elish’s report and recommendations. I will report their findings to council in August. Opposition SNP group leader Stephen Flynn last night claimed “systematic failures” had lead to the failings, and called on council chiefs to do “all they can” to comfort the affected families. He said: “This (report) is an absolutely damning indictment of systematic and disgraceful failings at Hazlehead. “There is no terminology too strong to condemn what happened at the crematorium. The legal firm representing some of the families affected by the baby ashes scandal have given the city council seven days to start talking – or face the repercussions in court. Thompsons Solicitors is pursuing compensation for a number of families in the north-east. And last night, firm partner Patrick McGuire, said the “gauntlet has been laid down firmly” before the city council’s chief executive Angela Scott. Mr McGuire said: “We have been forced by Aberdeen City Council to raise a large number of actions against them. “It has to be remembered that Aberdeen City Council stood apart from every local authority in the country, in that every other authority cooperated with us and worked with us. “It has to be remembered as well that some authorities have already settled every claim in their local authority area, and those that haven’t yet have certainly been involved in extensive, meaningful discussions. He claimed Ms Scott had “point blank” refused to deal with the families in the same way other councils had. He added: “It’s a complete and utter lack of compassion and human understanding. “I don’t think if in my entire career I’ve ever been as angry at an opponent as I have been at Aberdeen City Council. “Angela Scott has an extremely short period of time, she has seven days to open a line of dialogue with me and then if not we have to bash on with the cases immediately, and we will undoubtedly do that if we have to. Pressure was mounting on Aberdeen City Council last night over the baby ashes scandal with growing demands for “decisive action” from officials. The local authority was heavily criticised in the National Cremation Investigation – led by Dame Eilish Angiolini – which examined more than 200 infant cremation cases across the country. An Infant Cremation Commission led by senior judge Lord Bonomy was also found to have been misled about practices at the city crematorium. Last night, the council’s chief executive Angela Scott again apologised “unreservedly” – and asked the heads of legal and human resources departments to “consider the full implications” of the report. Ross Thomson, a Scottish Conservative MSP for the north-east, said there should be “accountability” at the local authority over the scandal. He told the Press and Journal: “The findings of this shocking report show a complete breakdown between those running Aberdeen Crematorium and senior management at the city council. “Parents and indeed the wider public will expect a degree of accountability for what has been a catalogue of failure at a very high level. “It is clear that members of staff lied about practices at Hazlehead during Lord Bonomy’s review in 2014. That is unacceptable. The investigation found it was “commonplace” to cremate infants in the same chamber as adults. Baby and adult ashes were then mixed together and given back to relatives of the adult, while the parents of infants were told there were no ashes. Last night, Ms Scott again apologised for the “historic practices”. She added: “I have asked my heads of legal and HR to consider in full the implications of Dame Elish’s report and recommendations. I will report their findings to council in August. “I also contacted the Inspector of Crematoria, Scotland and at my invitation he will undertake an inspection of Aberdeen Crematorium in the next few days. “I will of course share the results of this inspection with council.